The common dandelion (Taraxacum officinale) delights our eyes with carpets of stunning yellow composite blooms that invade grassy fields, the edges of roads and other waste places throughout mid to late spring. Despite being labeled as a nuisance and having an impressive assortment of biological and mechanical weapons specifically devised for it’s eradication, dandelions still hold a firm grip on our landscapes as well as our folkflore and traditions. For example, the common name ‘dandelion’ is derived from the French ‘dent-de-lion’ which means ‘lion’s tooth’ and refers to the jagged, irregularly toothed edges of the leaves. Another French name for this plant is ‘pis en lit’ which means ‘piss the bed’ [an excellent name for a beer!] and refers to the diuretic affect which results from consuming the leaves, flowers and roots. 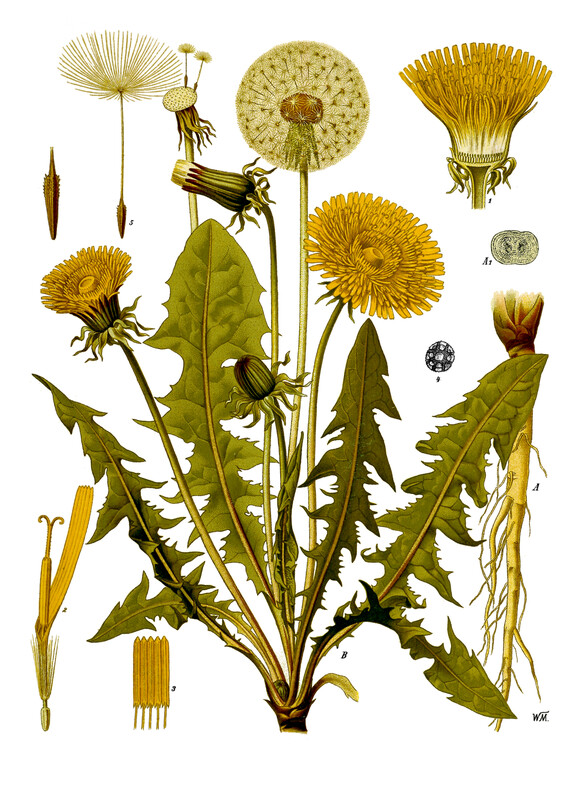 It has been known for centuries that the dandelion is a potent cleaner of the urinary system. In fact, the roots of dandelions have been used as a powerful and safe medicine since antiquity, additional to cleaning and strengthening the urinary system. Numerous studies and hundreds of years of practice have revealed that the plant is rich in important minerals such as magneseum and iron, and has the capacity to heal and detoxify our liver, gallbladder and bloodstream from accumulated bacteria and other toxins. 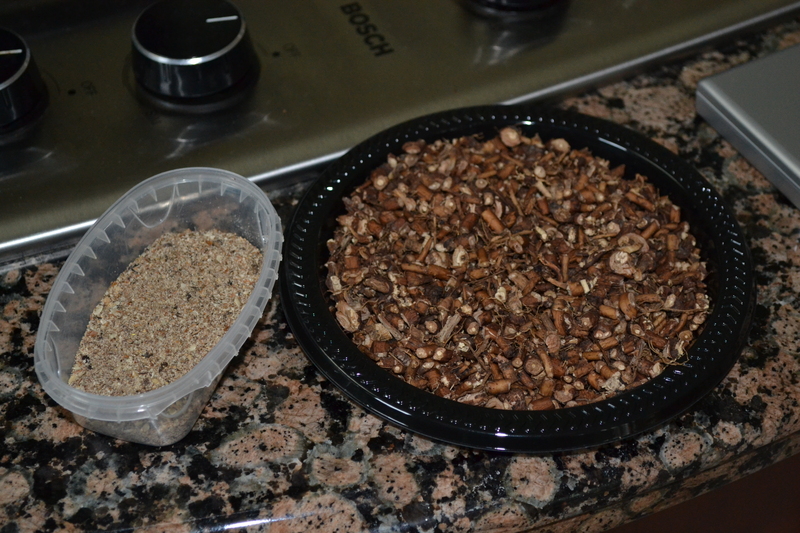 Ground milk-thistle seed and dried, chopped dandelion root. The bitterness of dandelion also excites and stimulates the production of gastric juices [yum!] and enzymes to be released into the stomach which assist in the proper assimilation and absorbtion of nutrients in our food. In Greece, salads featuring dandelion leaves are traditionally eaten before a heavy meal in order to increase the appetite and prepare the digestive system for the bulk of the meal which has yet to arrive. I have always regarded the spring as a time of renewal, rebirth and healing. 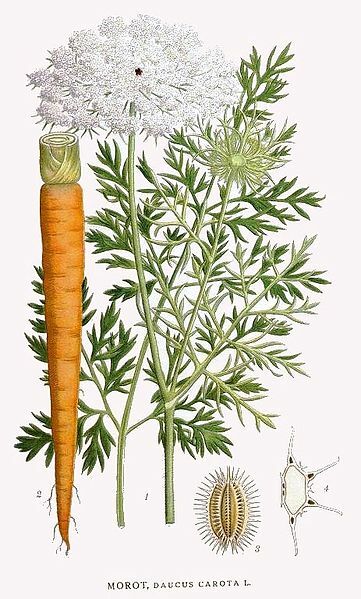 So what better way than the cleanse the body after a long, dark winter that is often accompanied by a monotonous diet low in fresh fruit and vegetables than with a spring tonic beer made with dandelion root? Here here, says I! Spring cleaning is most definitely not exclusive to the household. Part of experiencing the blessings of a new year includes making sure your body is healthy, clean and functioning efficiently. comments: I could not find any resources which describe the moisture content of dandelion roots. They do weight considerably more when fresh than dried, as would be expected. The original recipe from Sacred and Herbal Healing Beers recommends 4 dried ounces of dandelion root for a 4 gallon batch, which seems like a lot, so I am halving it based on what I have been able to harvest and not wanting to make the taste too strong. I definitely still want to feel the super dirty, earthy bitterness that is unique to dandelion. It is likely that arround 200 individual plants were harvested to compose the 2.2 ounces of roots. The boiling wort with dandelion roots. 2. 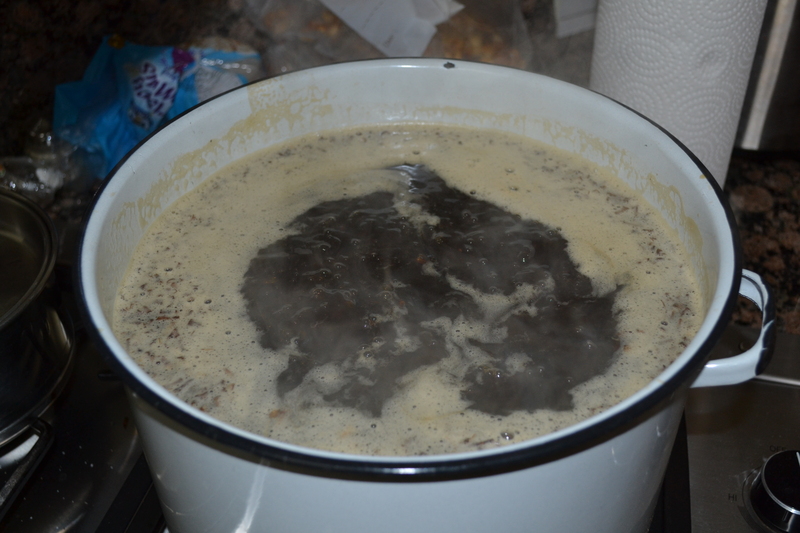 Once boiling, slowly pour in and stir 3 litres of liquid amber malt extract until it is dissolved in the water. 3. Add 2.2 ounces dandelion root, stirring to evenlydistribute them. 4. Simmer mixture for 15 minutes, stirring occasionally. 5. 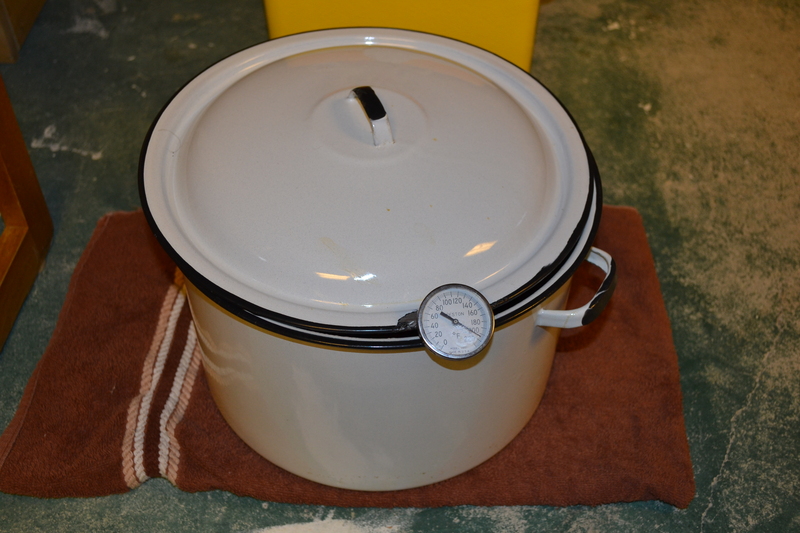 After the 15 minutes has passed, remove pot from heat. 6. Place pot of wort in a place where it can cool to room temperature. 7. 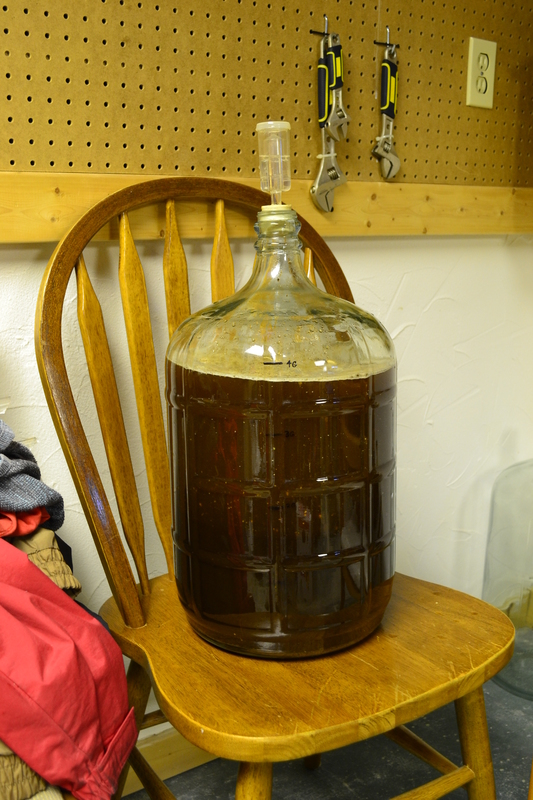 When cool enough, carefully pour the wort through a strainer and into a sterilized fermenter, such as a glass carboy. 9. Top up the carboy with cool water until it contains a total of 4 gallons. 10. Pitch 8 grams of yeast into fermenter and insert airlock. * The seeds of milk-thistle contain active compounds which are alcohol soluable and therefore not effectively extracted by boilding. The compounds in dandelions, however, can be extracted by water. By placing the ground milk-thistle seeds in the carboy during the fermentation process, those alcohol soluable compounds are extracted and remain suspended in the final product. I decided to add milk-thistle to this recipe because, like dandelion, they have potent liver strengthening and detoxifying capabilities and will also hopefully add an interesting bitter flavour of their own. More can be read about the medicinal applications of milk-thistle here. Yeast pitched and ready to start fermenting.